Al Faisaliah Hotel is located adjacent to the King Fahad highway/Riyadhs most prominent arterial road system. 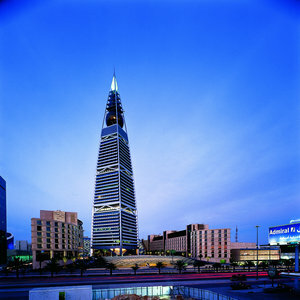 The hotel is linked as an integral part of the landmark Al Faisaliah Center and Tower/the Hotel is situate in the most prestigious commercial and residential area of olaya/surrounding the Al Faisaliah is a myriad of international companies located in Riyadh. The Diplomatic Quarter is only 10 minutes from the hotel and the cities international airport is located 30 minutes from the hotel. .The only Hotel in Saudi Arabia to offer 24-hr Butler service to all guest rooms and suites .In-room direct line guest faxes in all rooms .Guest Loyalty programme for regular guests .The only affiliated Leading Hotel of the World in Riyadh .All guest rooms have CD Player, Video, and Satellite TV .Highspeed Internet access at a cost .Complimentary Arabic coffee and Dates available to all guests .Free use of Hotel Health Club .The hotel forms a part of the landmark Al Faisaliah Tower/and exclusive Al Faisaliah shopping Mall .All rooms designer furnished and equipped with the latest state-of-the-art electronic touch tone controls .Rooms and suites are the most spacious in Riyadh ranging from 45 sq Mtrs to 260 sq Mtrs .Complimentay fruit plates and mineral water daily in all guest rooms. Located in the most prestigious commercial and residential area of the city .Only 10 minutes from the Diplomatic Quarter .The hotels 5 restaurants offer the highest quality and varied range of international cuisine options to guests. .Ladies private health and fitness club also available to hotel guest .The Globe and The Experience located atop the Al Faisaliah Tower are the Kingdoms first major tourist attractions, offering unrivalled views of the city and world-class dining options, and the citys only dedicated cigar bar. All nationals other than the GCC states require a valid visa to enter the Kingdom of Saudi Arabia. Please contact your nearest Royal Embassy of Saudi Arabia for more information.